Our staff is available 24 hours a day, every day of the year. We don't use an answering service. 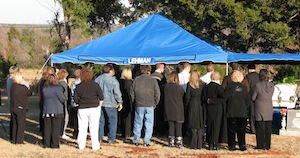 When you call Lehman Funeral Home you will be talking to a staff member. We believe that when a family calls upon us, it is vital to personally respond to your call. We are the only funeral home in Wellston that does our own embalming right here in Wellston by a licensed embalmer.